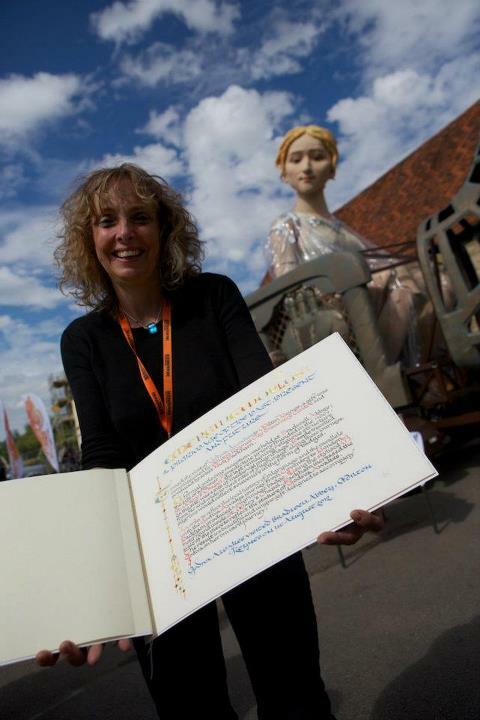 ← GODIVA AWAKES, BRADWELL ABBEY, ME, and thousands of others. 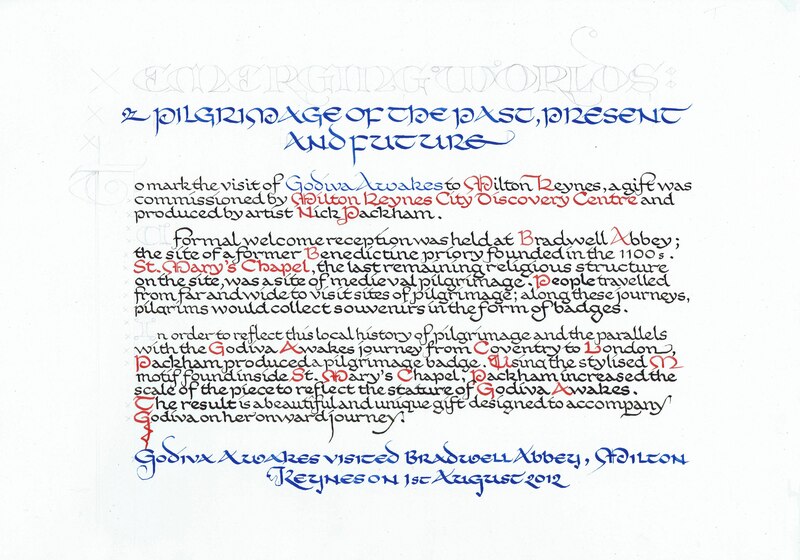 My first sight of the wording for an inscription to accompany the gift. 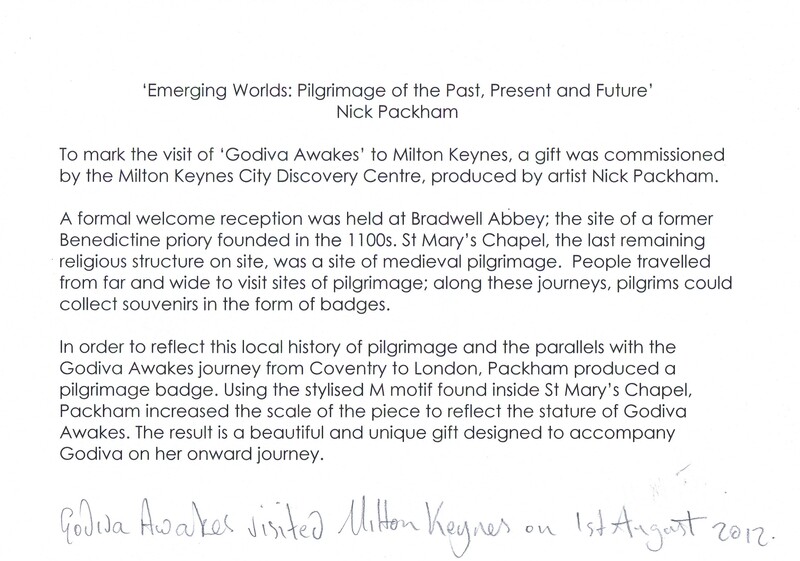 ‘Emerging Worlds’, commissioned from Nicholas Packham by Milton Keynes City Discovery Centre at Bradwell Abbey, to be presented to ‘Godiva Awakes’. My brief, to give this a medieval feel. 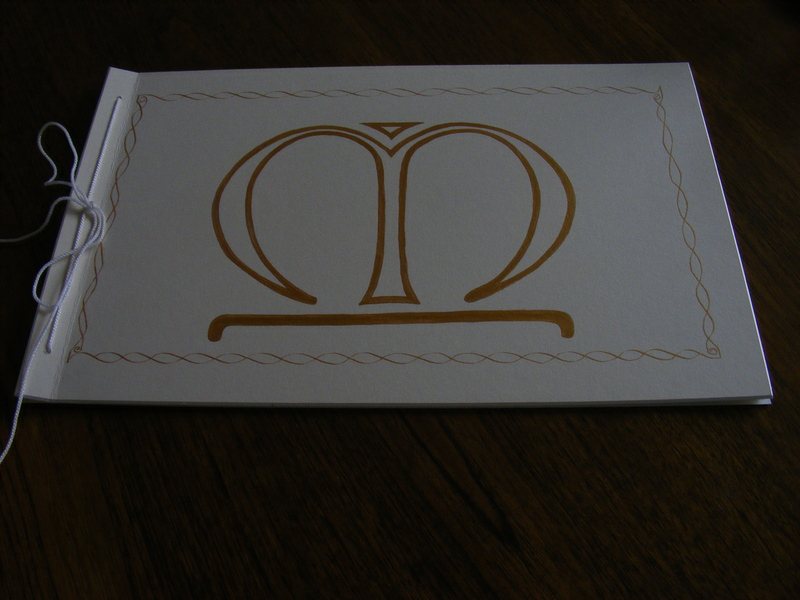 After playing around with the format and letter sizing I came up with this layout which seemed to work pretty well. I roughed out, just to get a feel for it on A4. No more playing around. No more practice. See Positive Practice. 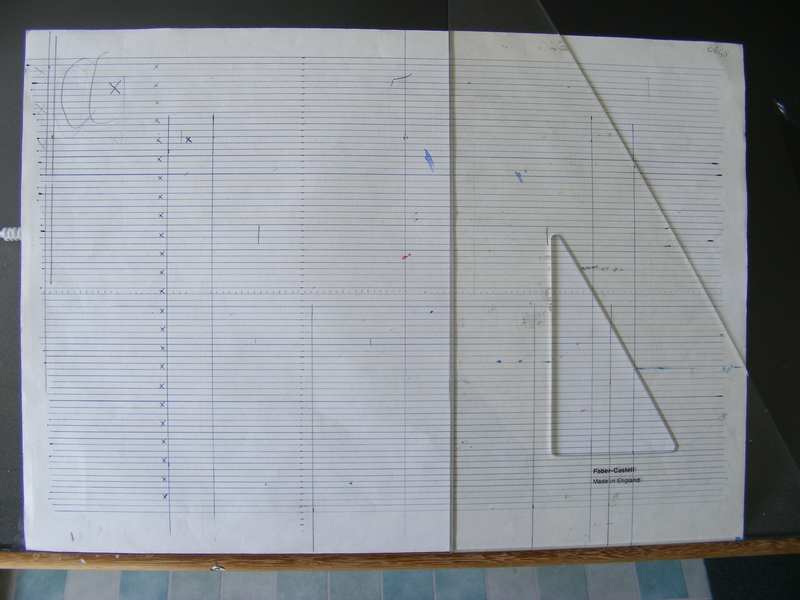 By using multiples of the 1/8″ lines. Three for the Versal capitals, Two for the blue Uncials and one as x height for the Carolingian / humanist text, and measuring the length of line in the roughs, I was then able to come up with this. Not a bad start. 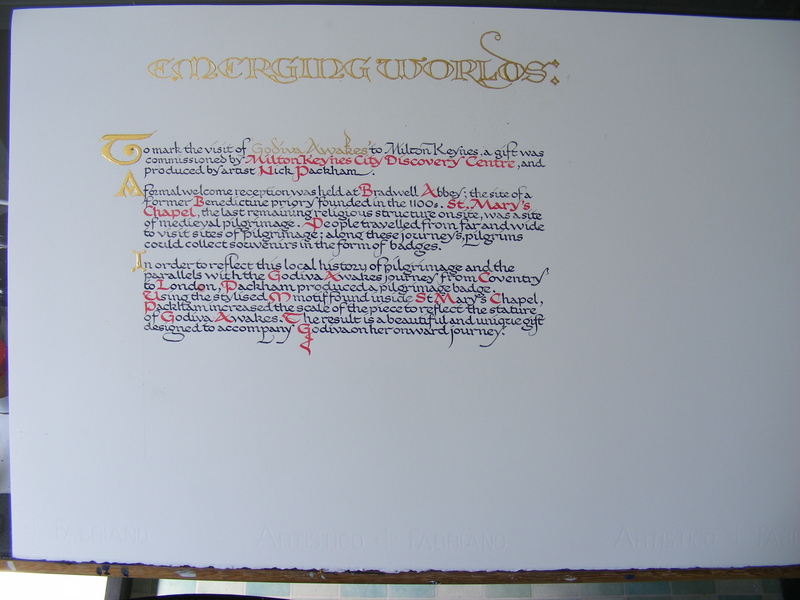 The Text was written first using Black and Vermilion acrylic. 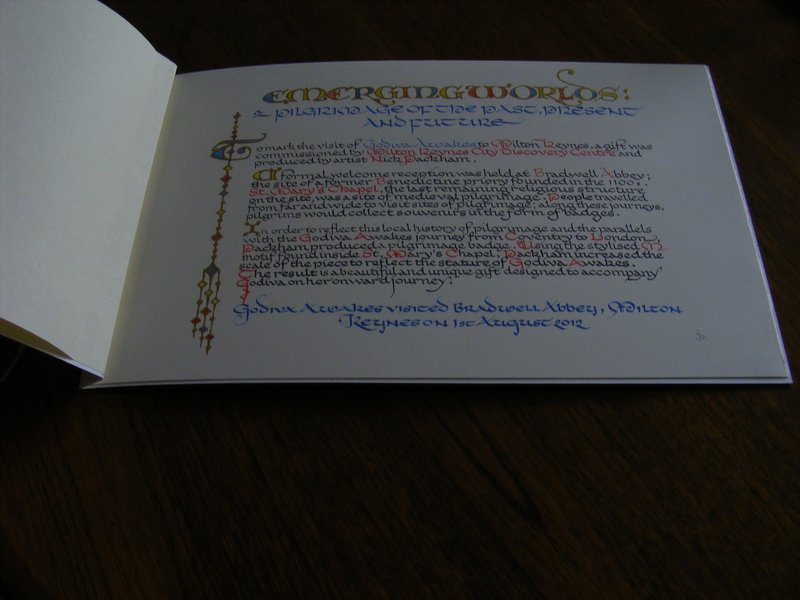 ‘Godiva Awakes’ written in Kolner Miniatum ink then gilded with 23ct loose gold leaf. The Versals were then added with a mixture of Robersons raising solution and just a drop of the miniatum. 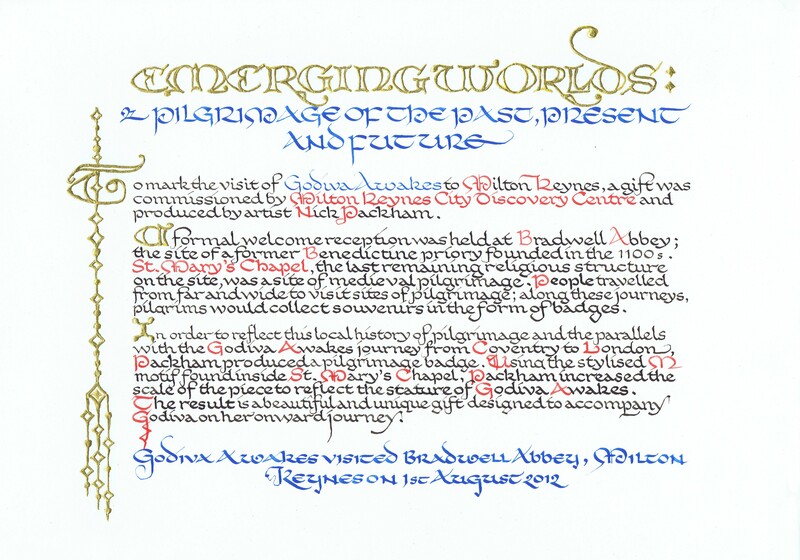 Then the loose gold was added, the cerulean blue text written and red, blue and yellow painted into the caps..
Then, after living with this for 24hrs or so, I could see where a few improvements could be made. 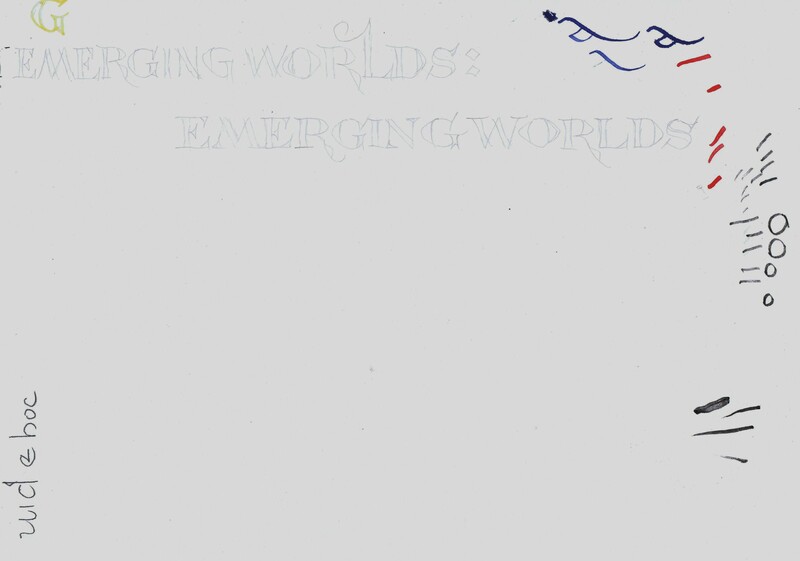 So, a deep breath, and using the first as a template, I made a start on the second. 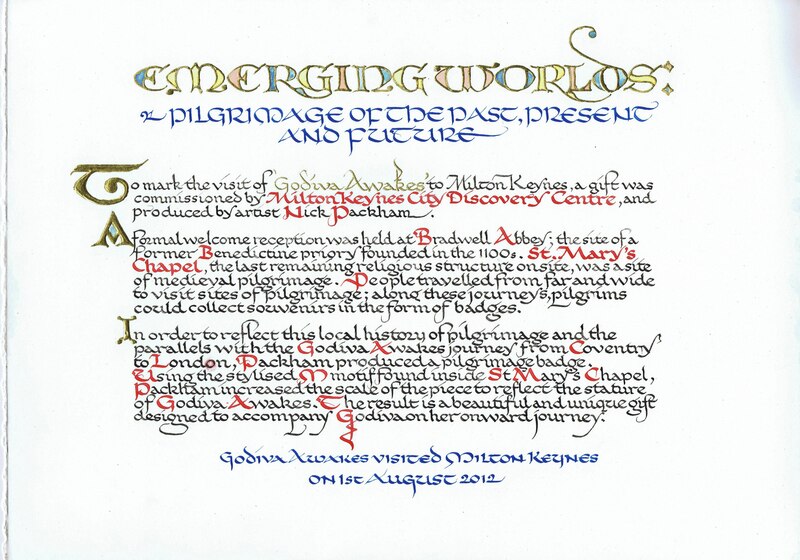 Then, using two sheets of matte board and a sheet of ‘Goatskin’ parchment paper, made up a booklet with the ‘M’ motif from St Mary’s Chapel drawn on the cover. There. That’s it. Another commission completed. As usual, after living with this for so long, I can still see room for improvement, but don’t I always? Heheh. Over all I am pretty pleased with the final result. 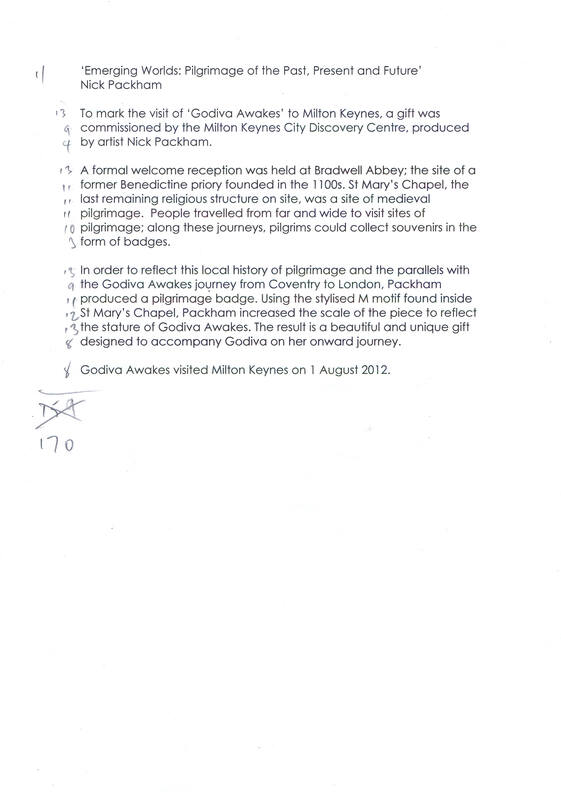 I hope Nicholas, the sculptor, finds this a fitting accompaniment for his very thoughtfully put together Pilgrim Badge; that all at MKcdc are pleased with their efforts in welcoming ‘Godiva Awakes’ to Bradwell Abbey; and I wish ‘Godiva and all who are involved in her epic Journey, God speed, good luck and lots more fun on the way to London and beyond. Oh a final thought. 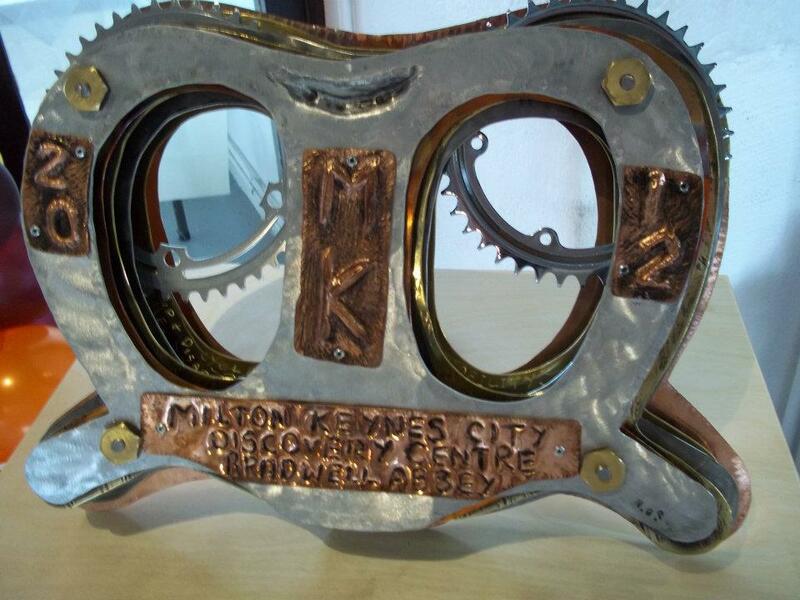 Perhaps you should ask Bradley Wiggins and all our other Cyclists in TEAM GB to help you on your journey back to Coventry. As usual. Keep watching this space. 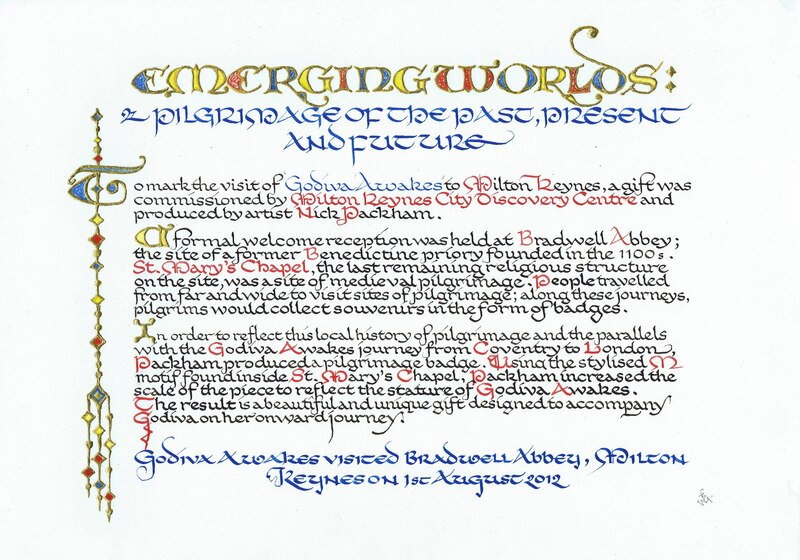 This entry was posted in CALLIGRAPHY,CALLIGRAFFITI,LETTERING,HOW TO and tagged Archaeology, Bradwell Abbey, calligraphy how to, Coventry, Godiva, Godiva Awakes, Milton Keynes, St Mary's Chapel. Bookmark the permalink.